FOOTBALL GOALPOSTS FOR SCHOOLS – WHAT IS THE AGE RANGE OF THE PLAYERS AND ARE THE GOALS THE RIGHT SIZE. 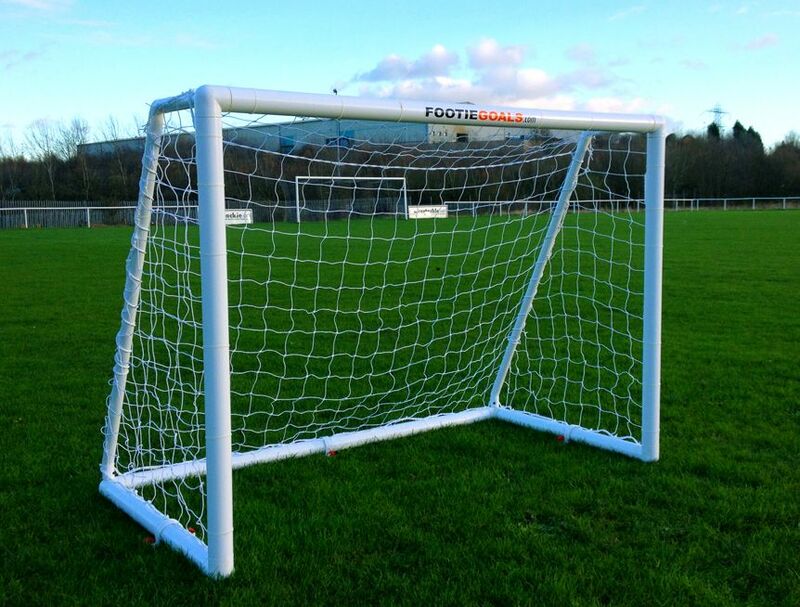 Age range is a factor to consider when buying Football Goalposts for Schools. The goal post height is relevant to to the child’s height. Children are growing taller these days but when a child grows into an adult they will only ever play in a full size regulation goal in adult matches, which is size 24′ x 8′ (7.3×2.4m). So with this in mind if the goal is for an outfield player the target ideally should be proportional to 24’x8′ . This is so that the practice of shooting is into a goal that is a similar proportion length to height to a regulation adult goal. 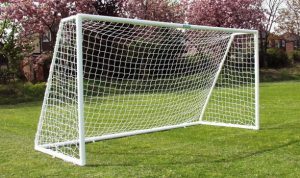 For example, a 12’x6′ (3.6mx1.8m) mini soccer goal or an 8’x4′ (2.4×1.2m) goal; these goals are proportionaly accurate so provide a more realistic goal size for a child. However, if you goal is for budding goalkeeper the goal width and height would be better to be a little larger to enable practicing diving. ITSA Goal Posts Ltd (John Wilson M.D.) created the first ever uPVC portable goal in a bag, way back in 1989 which was approved by the FA & FIFA and the goal size created which is now recognized as the official size played by all children under the age of 11 in official mini soccer leagues is the size 12’x6′ (3.6mx1.8). You can see by the size chart below this is an approximate proportional goal so children have a more realistic goalpost for their size. 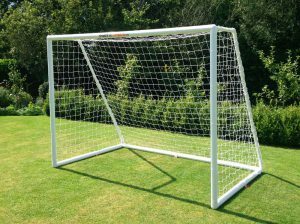 With this in mind if you garden is large enough the 12’x6′ goal is a great size of goal if your child is around 9-11 years of age as they may start to play in this size of goal in local leagues. Under-7s and under-8s football should focus on fun and developing technical ability, so it’s recommend the FA’s regulations on goal size are followed. Children should be playing 5-a-side matches at this age, which requires a size 3 ball and a pitch of 40 yards by 30 yards. 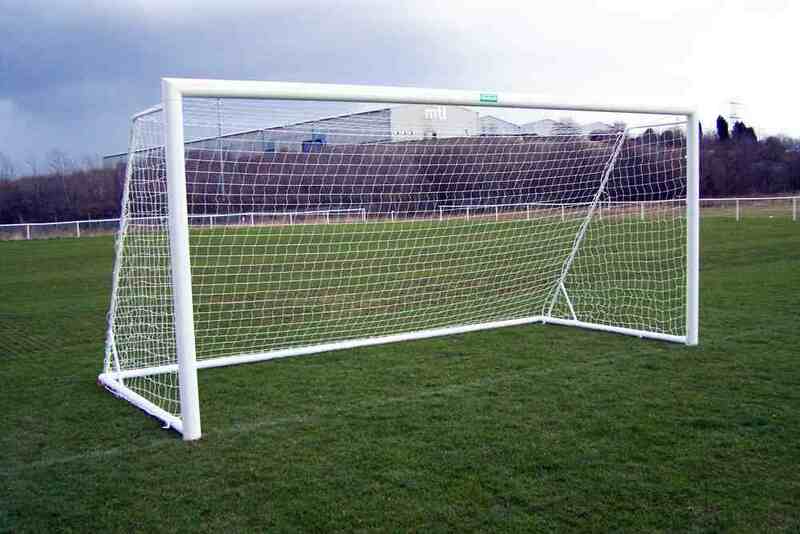 You will need to purchase goals that are 12 feet wide and 6 feet high in order to comply with FA rules. 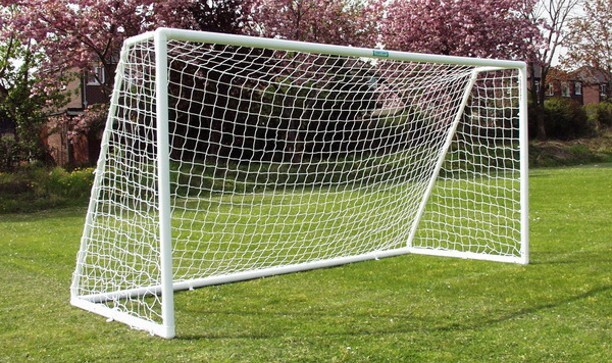 Under-9yrs and under-10yrs should be playing 7-a-side matches with mini soccer goals measuring 12 ‘x 6’. However, under-9yrs should be playing with a size 3 ball, and under-10yrs should be using a size 4 football. 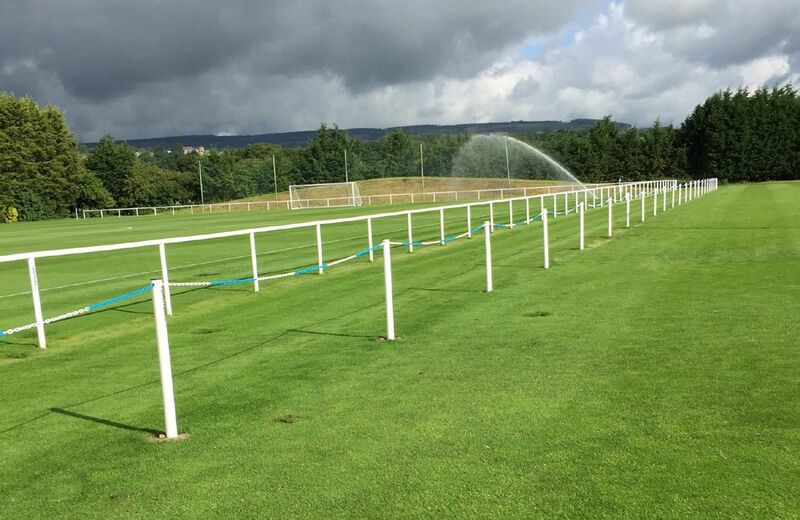 Children normally start playing 11-v11 games at this stage however, they will still play on smaller pitches. A pitch used for under-13yrs and under-14yrs football should be 90 yards by 55 yards, and the goalposts should measure 21’x7′. Under-15 yrs and under-16 yrs football is played with the same ball used in the professional game, and with goalposts measuring 24’x8′ – the regulation professional standard. The pitch is slightly smaller at 100 yards by 60 yards. This is the age group at which players make the final transition to full size. 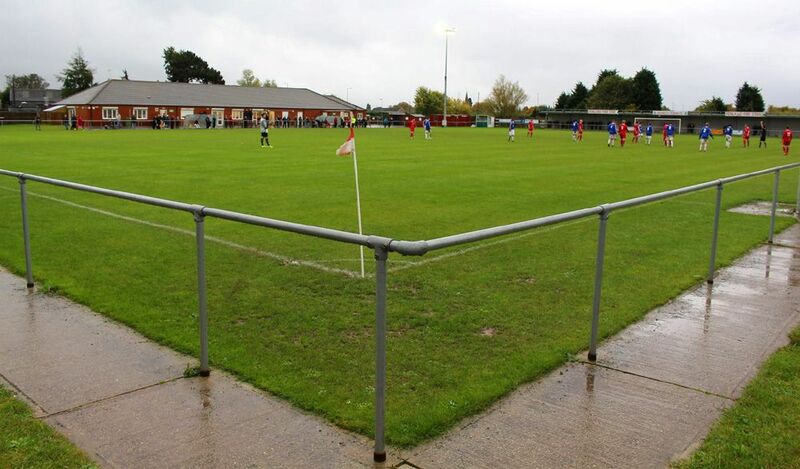 The FA states the games should be played on a pitch of 110 yards by 70 yards, within the rules the pitch can reduce the size of the pitch to as low as 90 yards by 50 yards this is to cater for different areas available. Goalposts must be 24’x8′ regardless of the size of the pitch. PLEASE CLICK HERE TO DOWNLOAD THE FULL FOOTBALL GOALPOST FOR SCHOOLS DOWNLOADABLE GUIDE. 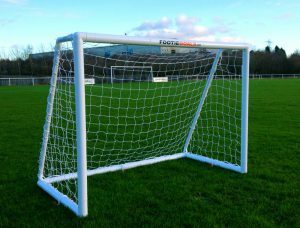 uPVC: Our ITSA GOAL range of freestanding PVC goals are made from high impact uPVC which makes them extremely strong yet lightweight and portable. They are also weatherproof and will last many years. uPVC is lightweight and so is safe particularly for the very young. The goal can also have a very long lifespan. Steel: We do not recommend steel goals for young children. Freestanding steel goals are heavy and dangerous when the anchors not be used properly. The only exception is socketed steel lockable anti- theft goals that are patented and only available from itsagoal and soccertackle. Aluminium: The advantage of weighing less enables freestanding goal to move easily. Aluminium goals are more expensive but do not rust. 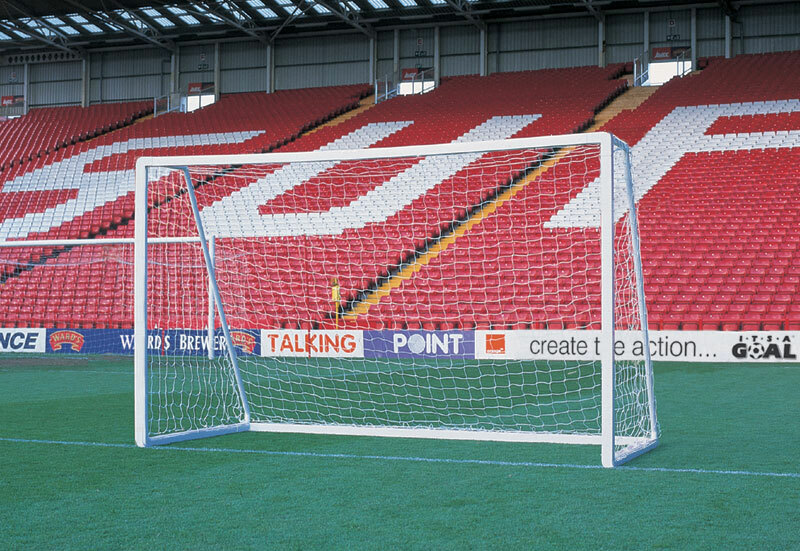 The goals have a proper rebound and you will not get a dip on the larger plastic goal crossbars. ITSA GOAL is an FA suitable football goal supplier and our aluminium goal range has passed strict independent BS safety standards tests. 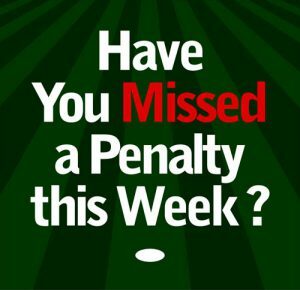 Don not be fooled by companies using sandbags or water weights on freestanding goals – a litre of water weighs approximately 1 Kilo, therefore weights along a full size goalpost can only weigh around 8 kilos which is not sufficient in line with the goalpost safety standards BS8462. The current advice is 112 kilos for full size freestanding goals to prevent toppling. Please note law one if the game requires elliptical goals to have the longest length of the oval post to across the goal line and not along it. some companies are still selling goals that do not conform to this basic rule. We advise checking this as the current standards state that goals must conform to the laws of the game . contact john@itsagoal.net for any technical queries. BUY FROM AN ESTABLISHED football goalposts manufacturer in the UK – IF YOU BUY AN IMPORTED PRODUCT from the far east you may not be able TO BUY SPARE PARTS and that is why these end up in a landfill ….”Made in the far east buried in Britain” Buy sports equipment, not a flimsy toy and they will last you years especially if the goals have extended warranty. so great to support British products. Very highly recommended. FOLDING ALUMINIUM GOALPOSTS I would just like to say how pleased we are with the lockable fold-in Mini-Soccer goals we recently purchased. We have fastened the netting permanently onto to frame because they can be easily stored and carried with the netting fixed. 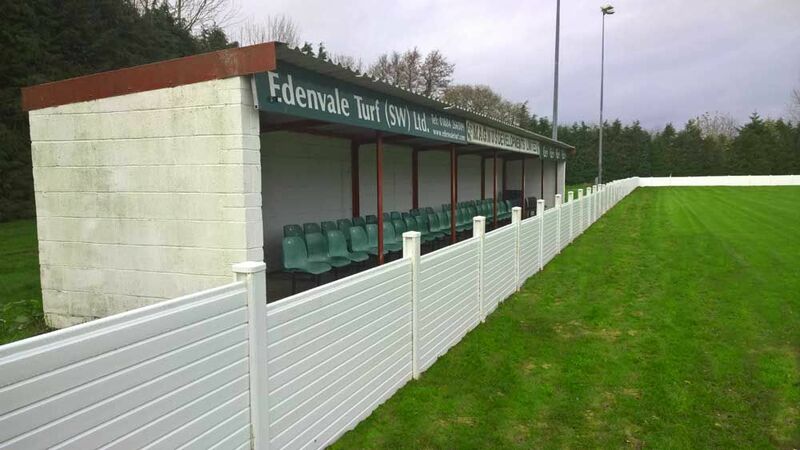 Once carried to the pitch the goalposts can be erected and secured to the ground within 60 seconds which is absolutely fantastic. 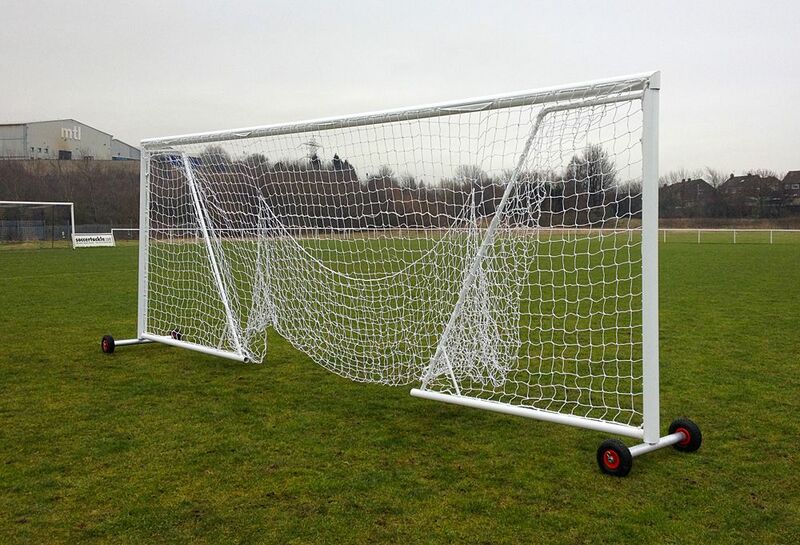 As well as being easy to erect they are also the best and most professional looking goals in the league. Every team that comes to play us comments on the football goals. We have tried several types of goals over the years. Plastic, fully erected aluminum, solid D-side bracket types and these are by far the best we have ever had. Well done to its-a-goal for a fantastic, innovative design. 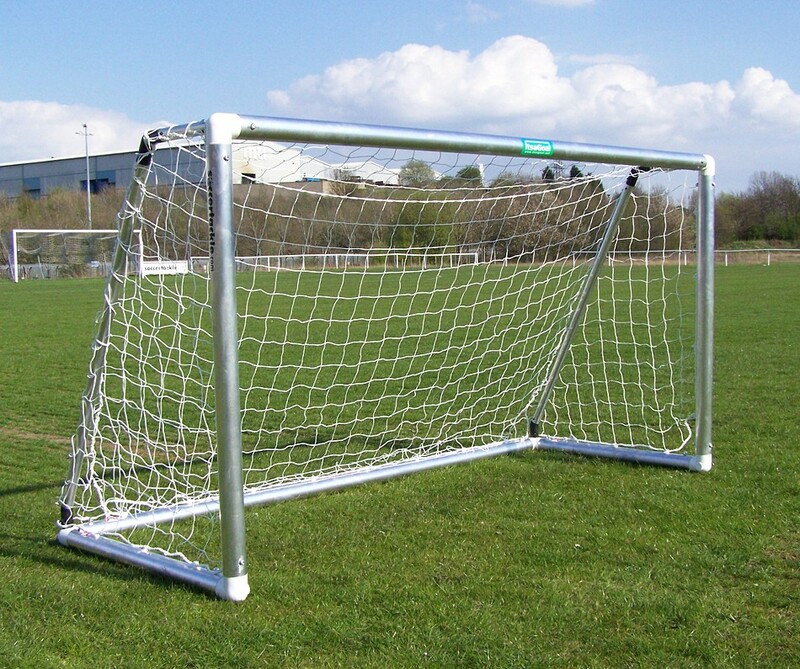 CLICK HERE TO VIEW THE BEST RANGE OF SCHOOL GOALPOST IN THE UK. 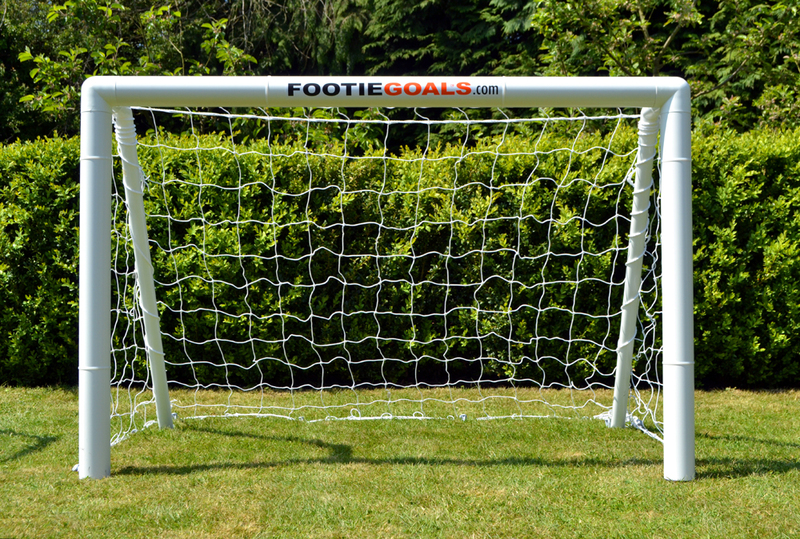 These great little Football Goals for the Garden are available from soccertackle.com. The goal shown above is the 8′ (2.4m) wide by 4′ (1.2m) high goal. 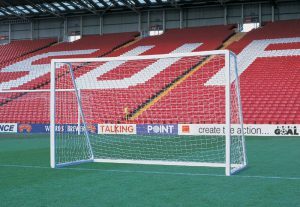 This range of goalposts are the FOOTIE GOAL range and are available in the following goalpost sizes 4×3 goal, 6’x4′ goal, 8’x4′ goal, 8’x6′ goal, 12’x6′ mini soccer goal. 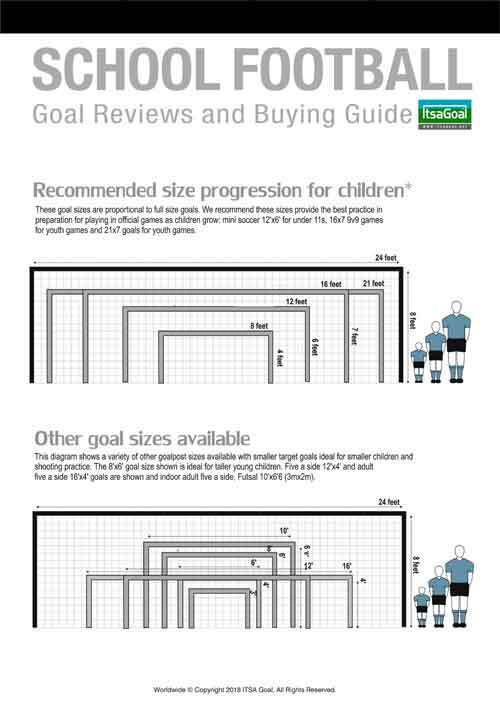 These different goal sizes cater for all age ranges of players and also for different garden sizes. A unique ground anchor system that does not require any digging firmly secures the garden goal onto any grass surface. Made with UV stabilized high impact uPVC this garden goal has unbreakable polypropylene strengthened corner brackets. A cost effective quality alternative to Forza or Samba Goals and other Far East toy goals flooding the market. These 8x4 garden goals are Made in Sheffield and are safe and easy to use. Competitively priced with free delivery they take some beating. The ideal football goal goal to keep fit and have fun with in your garden. The Goals are made in weatherproof high impact U.V.stabilized uPVC. 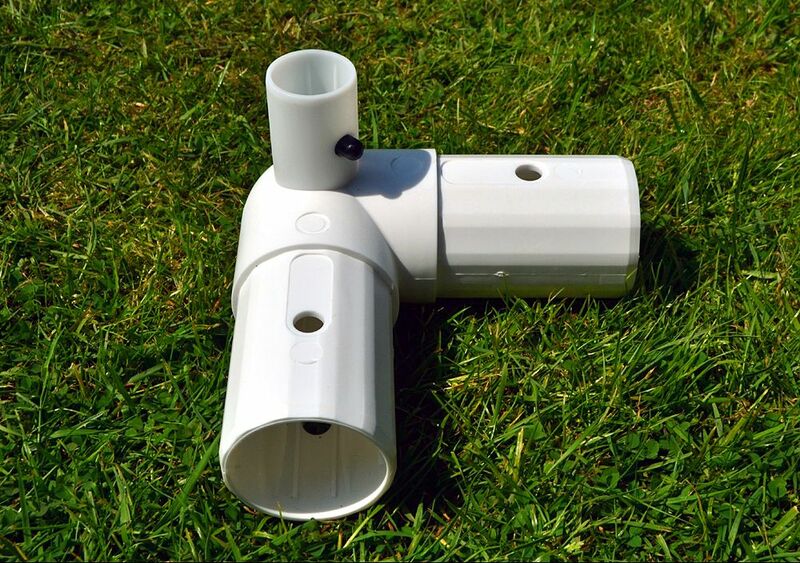 The corner brackets are manufactured in reinforced polypropylene so you will not need to buy spares in the future as these corners will last a soccer lifetime. The FOOTIE GOALS are easy to assemble and push together. The Goals are made in weatherproof high impact U.V.stabilized uPVC. Our Net support tubes are made in a stronger larger wall thickness than other garden goals. 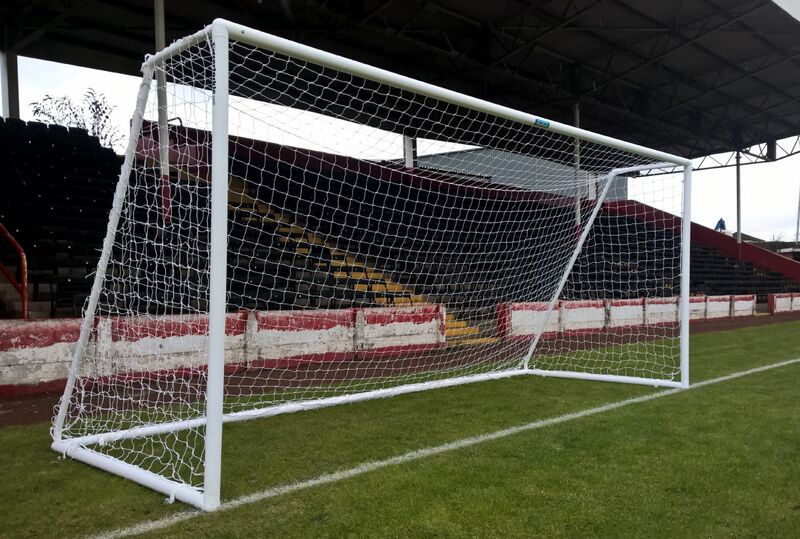 Other goalposts on the market have net support that have to bend to tension so they stay pushed into holes, in contrast our goal net supports do not bend due to the thickness of the material. They stay firm and straight and also lock properly into the corner bracket so that they do not come apart during a game. 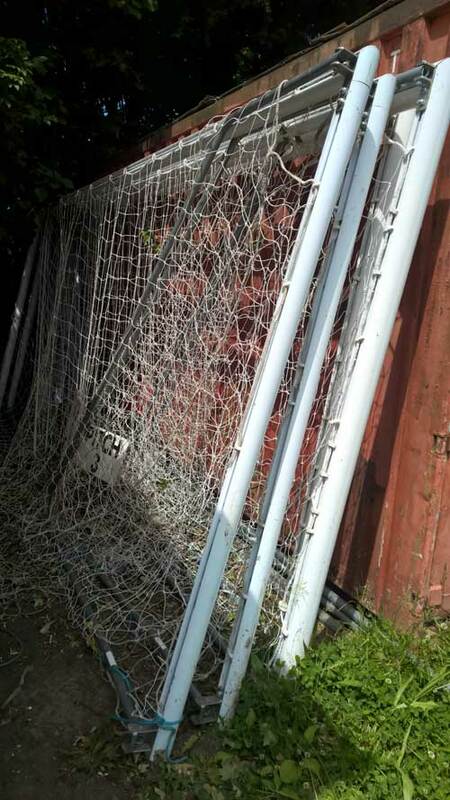 The FOOTIE GOALS include top quality white nylon weatherproof nets. The Nets are much better than Pea netting seen on low cost imported type goalposts. 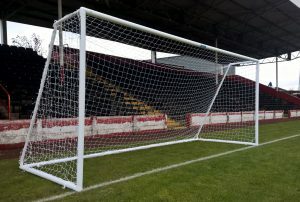 In contrast these nets are the same style as seen on full size adult goalpost, They are knotted so are also repairable. Fitting instructions are supplied and there are details of how to maintain your goal and goal net so it will last many years. 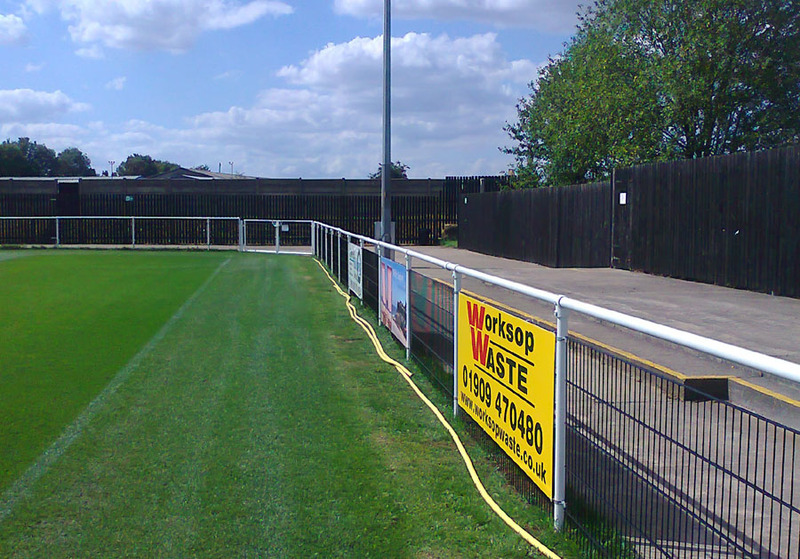 Today we’re covering the best football goals for sale for the garden. Upvc garden goals are ideal for young children owing to goals being lightweight and safe. 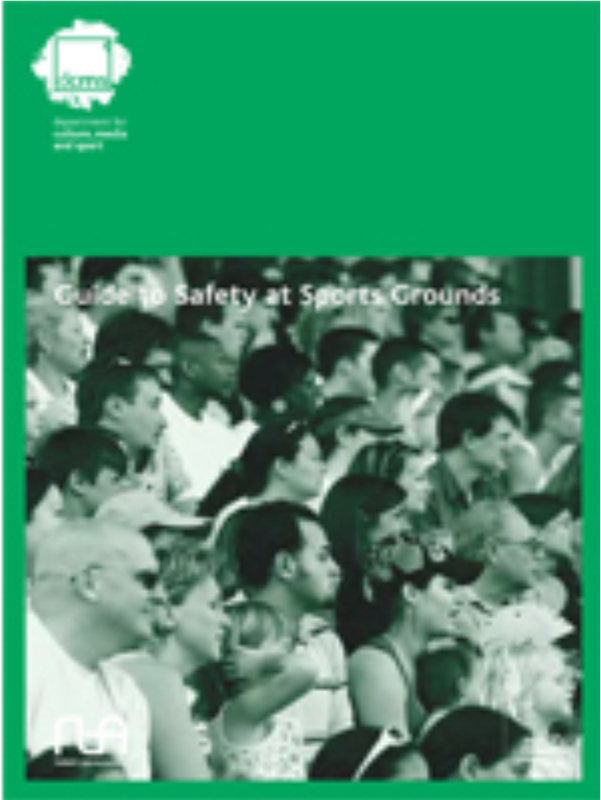 All goals reviewed are tested to the relevant safety standards. All the goals shown include goalpost guarantees. World cup goals sizes 12’X6′ Goals, 8’X6′ Goals, 8’x4′ Goals, 6’x4′ Goals, 6’x4′ Goals. If you are looking for strong garden football goals that will last and that are quick to assemble and easy to store after use then these are by far the best option. With Free carriage included you will find these goal prices very competitive. Most other suppliers do not include the cost of carriage in the price they show and when carriage is added they often end up costing around the same or even more than our garden goals. 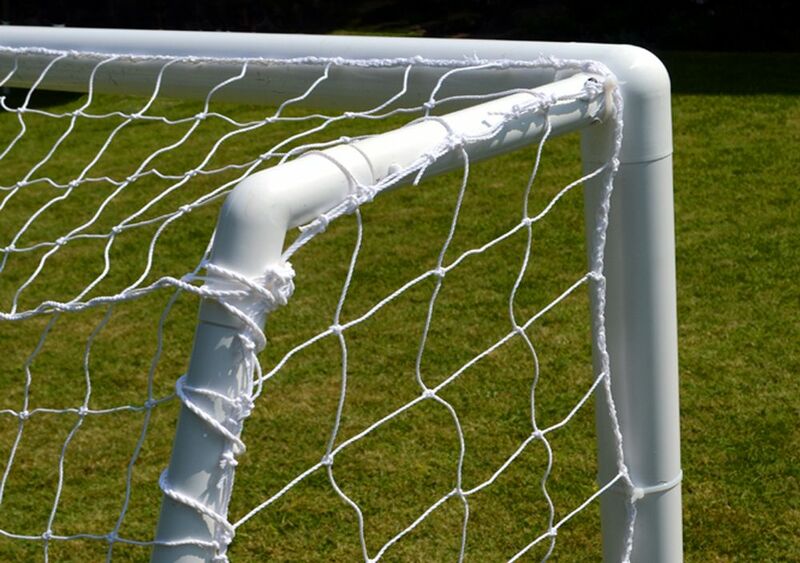 Better quality longer lasting nets, specially strengthened goalpost connectors and an unmatched manufacturers warranty. Do not take our word for it see what customers say. 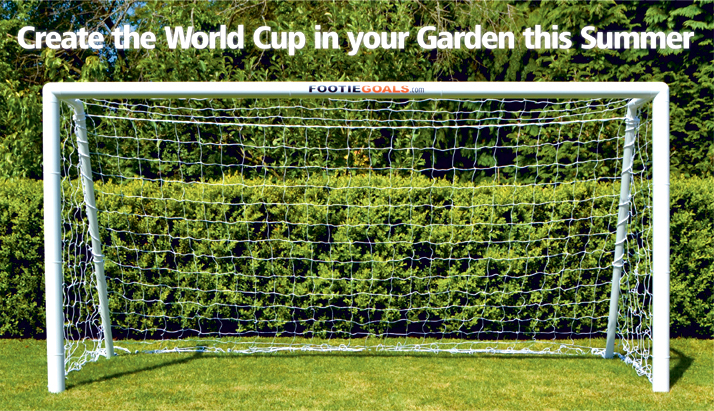 Just a few reviews are outlined below the best World cup goals ideal for your garden. 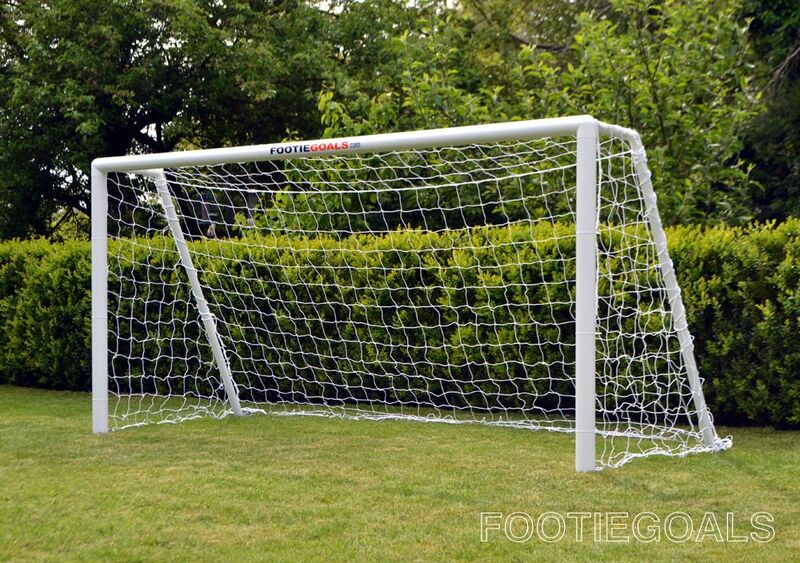 The Best World Cup 8’x4′ Garden goal – Click here for best goalpost prices. 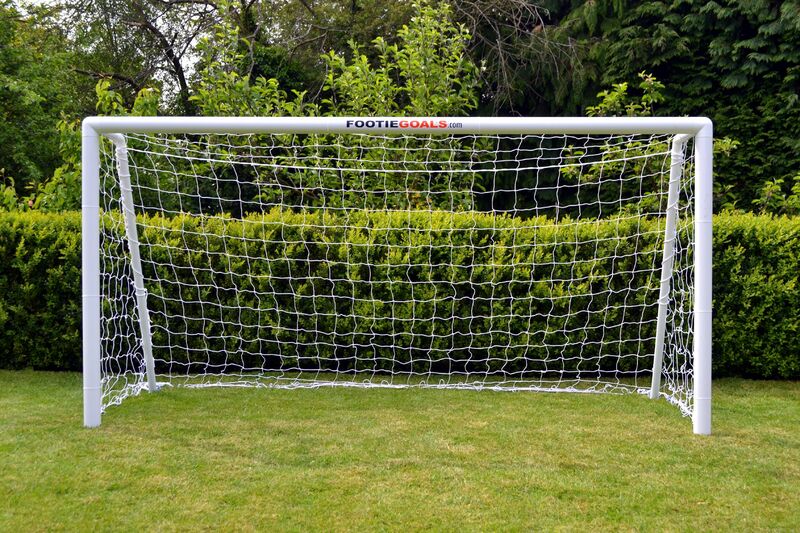 The Best World Cup 6’x4′ Garden goal – Click here for best goalpost prices. 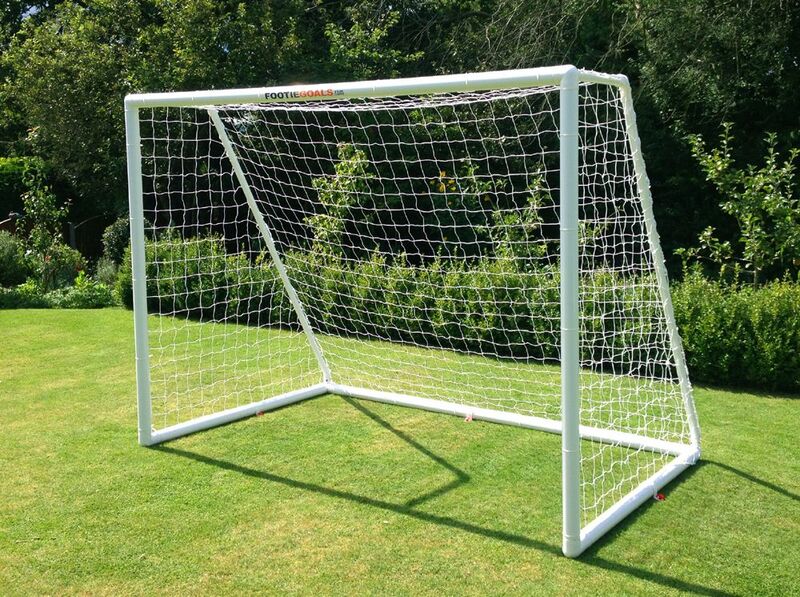 The Best World Cup 4’x3′ Garden goal – Click here for best goalpost prices. Garden Goal user: Thanks for the Goal post! It does look good set up in the garden and much more sturdy than the last two £19.99 ones that are now in a landfill! 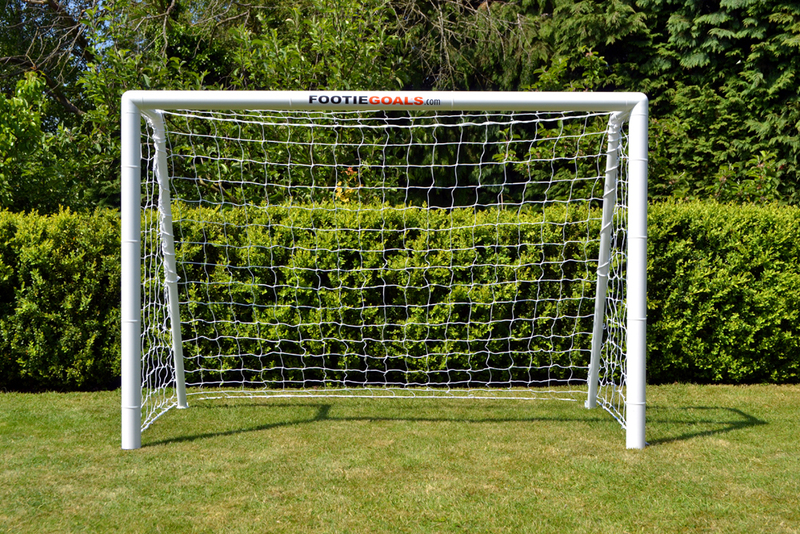 For larger garden goals visit soccertackle.com, upvc and aluminium goals available in larger 12’x6′, 16’x7′ goal sizes. Way back in 1959 when the chairman of ITSA GOAL made the first mini soccer goal as a young ten-year-old boy he was not aware how that decision would go on to change football around the world. Many years later in1992 he went on to form ITSA GOAL and produced the very first plastic goal for children. At last easy to use lightweight and safe football goals were available for children and blazers for goal posts were no longer needed. The small-sided game with proportional pitches and goals was born and in conjunction with the Football Association the game flourished and the rest is history. From those early beginnings, a revolution in women’s football in the UK started as girls were introduced to the game at primary school which had never happened previously. It allowed many more young children to become involved and all the superstars of today started in the game by playing mini soccer. Smaller goals, proportional pitches fewer players more touches. As the new game grew it was inevitable that the plastic goal post-market would expand and other brands would appear to take a slice of the new emerging market. The most successful being Samba Goals and recently Forza Goals. Many other poor quality copies also emerged from the Far East predominately for sale in online outlets like amazon Argos and Tesco as well as the large warehouse type stores. The reviews speak for themselves on these products all of which are gathered by paid review companies. 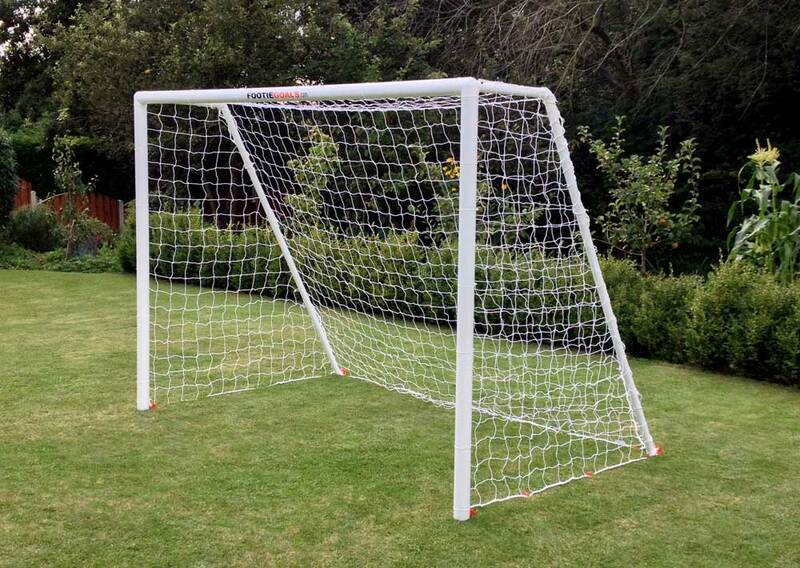 It still remains to this day if you want independent direct product reviews from users, if you want plastic goals with straight crossbars, if buyers want better longer lasting nets combined with a longer warranty then the original plastic ITSA GOAL posts are still regarded as offering the best value for money. Footage captured by the Sky Sports high definition cameras, now installed at the back of football nets, have enabled Director of Sport & Exercise Sciences at Liverpool John Moores University, Professor Tim Cable, to study last season’s UEFA Champions League and this season’s Premier League penalties, to pinpoint the optimum technique for taking winning spot-kicks. * The ball needs to cross the goal line at exactly 0.5m below crossbar and 0.5m inside the post. * The ball needs to be kicked at a speed greater than 65mph. * This requires a run up of 5/6 steps. * The striker needs to commence his run up from the edge of [b18 yard[/b] line with an angle of approach of 20-30 degrees to the ball. 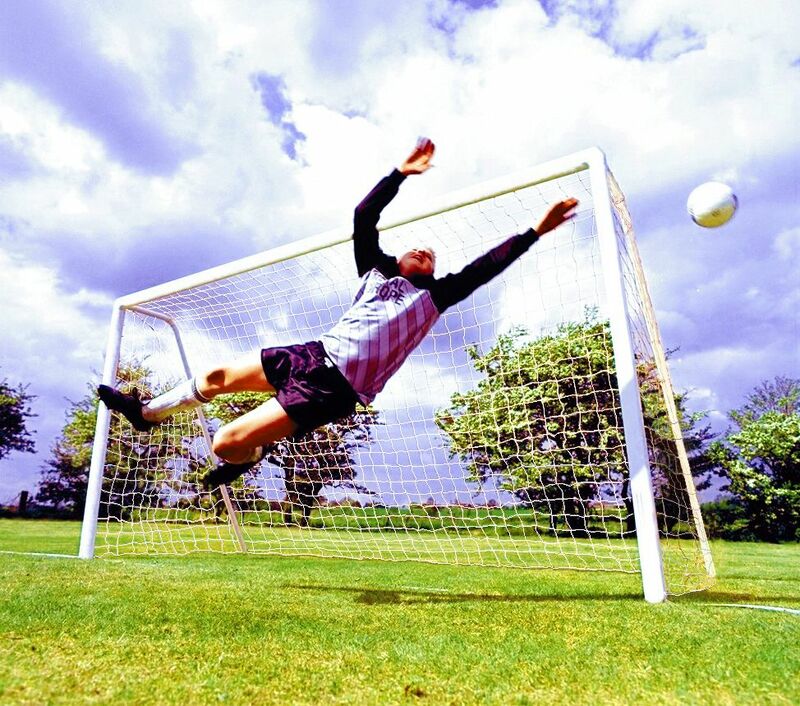 A penalty strike following these guidelines – requiring extreme accuracy and speed – is, according to Professor Cable, a ‘high-risk strategy’ but ‘virtually unstoppable’ by a goalkeeper. With dedicated practice, it would ensure a 100% scoring rate.